imcGames posted Q&A #4 on their blog. Hi, I`m developer SY Kim. TOS is a game which is currently under development. Therefore, please understand that the answers that are given below can be changed in the future. Furthermore, “R○○narok” is not related to TOS in any way since all rights of the game belong to the other company. Therefore, do not misunderstand TOS as a sequel to “R○○narok”, and for those of you who send us questions without knowing this fact, please do not get confused. A) We temporarily inserted a feature which allows recording in-game video clips since that makes easier for us to develop the game. However, we haven’t decided whether or not to insert this feature in the official version of the game. It will be possible to take screenshots in the official version of the game. Q) I heard that it is possible to automatically form a party when players are just nearby each other. Is it also possible to manually select the members within each party? A) After FGT, We found out that lots of people feel awkward and difficult on this automatic matching people to form parties so we are modifying the party feature so that everyone can understand it easily. We will tell you more about it when our development is completed on this feature. Q) Is there card system in TOS? What about fixed Loot and XP system? Are items’ stats fixed? A) We do have cards in the game, but we don’t have any system which allows combining those cards on to items to have any optional effects on items. The types of items and XP that can be obtained from the monsters in the game are fixed for each monster. However, when a player’s level exceeds monsters’ levels too much, then EXP points that the player will acquire will start to diminish. Items’ parameters are also fixed by item’s category and parameters can be improved by inserting jewels on items. If you insert a magic amulet on to an item, extra options will be activated. Jewels and magic amulets can be inserted together. ▲ Magic amulet and gris-gris are inserted to the sheild and the sword. Q) Is there a guild system in CBT? A) CBT will be small scale and we are planning it for a short range of period so there won’t be guild system in CBT. Q) I saw a spear from a video clip. Is there a knight who uses spear in the game? This is very important to me. A) We have a class which is specialized in using spear. Especially, Hopelight which uses one handed spear and a shield will become much more powerful when it is with Centurion class. ▲ Centurion Army put on the Hoplites. Q) What does Wugushi mean which was mentioned in Questions and Answers #3? A) In Chinese letters, it is written 巫蠱師. We got an inspiration from the tribe who were specialized in making and using poisons. Q) Are the characters all left-handed? They were attacking with left hand when I watched a video clip. Please think of it as the image reflected from mirror. Q) Are there daggers in the game? A) Daggers act as sub-weapons in TOS. The items that will be equipped on left hand will all be called sub-weapons and some of them can be used by pressing C key. When you are equipped with a dagger, you can attack the monsters using C key. 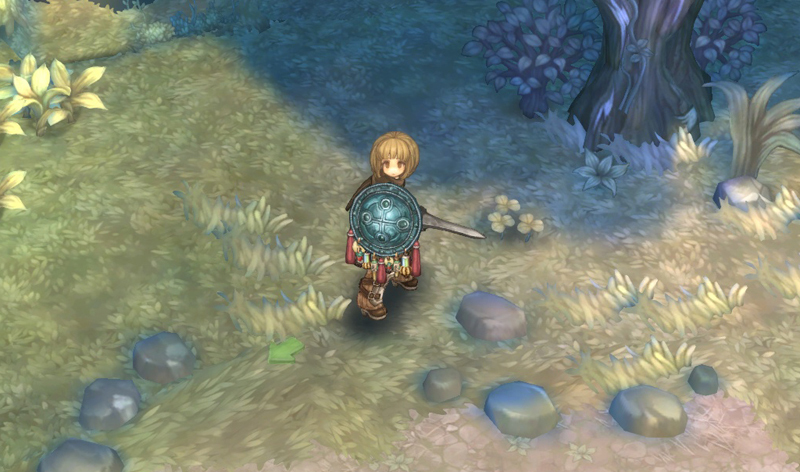 Therefore, certain classes in Swordsman can attack faster by pressing Z key and C key repeatedly. There are other sub-weapons such as magic items which can use unique skills and some other equipment that are not really important in the game. A) Yes. They are random. But the monsters are made to pull each other so they can be grouped together. Q) Is it possible to change BGM on each map? A) We haven’t decided yet. Do you need a player which can switch to different music in the game? Please send us your suggestion. Q) How do stats work? Is it possible to freely allocate the points to stats that have been accumulated by leveling up? A) 1 point will be given after each level up. You can freely allocate this point on any of four stats. Q) Can we have pets in TOS? If there are pets, will they assist us in battles or boost our stats? Are there mounts in TOS? A) It is hard to clearly distinguish between pets and mounts in TOS. Some of the pets in the game can be used as mounts and some mounts can help you in battles and the level of closeness between you and the mounts can be increased. In our development team, we call them collectively as “Companions”, and this word may become the one of the official glossaries in the game. Some companions can’t be riden nor it can help us in battles, but they will either help us in transportation or in other ways. There will be many types of companions in the game. but i would like to know if it's possible to dual wield sword and if yes if you have special off hand swords or if sowrd can be equipped in main and off hand. I assume swords are distinguished from daggers based on how they're wielded - normal grip for swords, reverse for daggers. If I'm right, the training dummy scene actually involves dual swords (it's exceptionally fast towards the end, but only because of introducing the attack cancel mechanic), while the succeeding scene involves sword main and dagger off-hand (their hint on characters being left-handed was important in identifying this). Laima wrote: I assume swords are distinguished from daggers based on how they're wielded - normal grip for swords, reverse for daggers. If I'm right, the training dummy scene actually involves dual swords (it's exceptionally fast towards the end, but only because of introducing the attack cancel mechanic), while the succeeding scene involves sword main and dagger off-hand (their hint on characters being left-handed was important in identifying this). yes you're right I tend to forget about the left hand "mirror". I kinda hope they will change it because I'm not really sure that you can see it better (it just depends in which direction you are looking) and it can cofuse you when your right hand weapon ist left. Besides, they did say that design decision was precisely to make movement look better. I'll just take their word for it. Wait, where was this stated/shown? I see. It's probably that statement which prompted players to realize in the first place, and I'm guessing that devs took it back by now. I rewatched the first video and saw the early equipment window (which may or may not have been replaced by the one from the barracks). The second row contained main hand, armor and off-hand slots from left to right, though there were only slots and no labels.